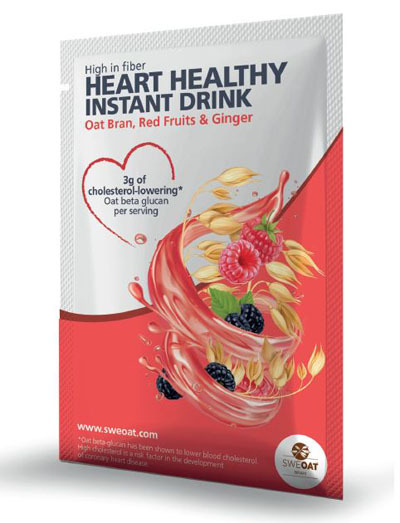 Exhibiting on stand E10, Naturex will highlight Sweoat Brans, a new oat beta glucan-based solution that delivers a range of EFSA-approved heart health benefits. Alongside this will be Naturex’s Aronox aronia berry extract, shown to improve a number of biomarkers for cardiovascular health including endothelial function, which is important for better blood circulation. Naturex will also showcase Acerolife, a premium extract highly-standardized in naturally occurring vitamin C sourced from the acerola cherry. Following its acquisition of Swedish Oat Fiber last year, Naturex has developed Sweoat, a high-quality source of beta glucans with benefits for heart health and beyond. This powerful ingredient has European approval to carry health claims for cholesterol reduction (Article 14.1) and maintenance of cholesterol levels (Article 13.1). In addition, it is authorised to carry claims for glycaemic response and gut health (both Article 13.1). Sweoat offers fibre and protein content and contains all of the essential amino acids, as well as healthy antioxidants. Just one 11 g scoop of Sweoat contains the same amount of beta glucans as 750 mL of oat drink and three bowls of oat cereals – and significantly fewer calories. Sweoat is suitable for use in a wide range of food and beverage applications and in conjunction with probiotics. At Vitafoods Europe, Naturex will showcase the potential for product development with Sweoat in a range of prototype instant drink formulations. Naturex’s heart health line-up at Vitafoods Europe will also include Aronox, an extract of aronia that delivers cardiovascular benefits supported by several published peer-reviewed clinical trials, including improvements to circulation. The latest clinical study (soon to be published), conducted with 55 healthy men aged 18-45, demonstrated that Aronox significantly improves endothelial function just 2 hours post consumption, compared with a placebo, and after 3 months of continued use. Meta-analyses have shown that improving endothelial function by 1% leads to an 8-12% reduction in the risk of developing cardiovascular disease. Pascale Fança-Berthon, Scientific Co-ordinator at Naturex, will discuss Aronox and its benefits in a presentation at Vitafoods Europe 2018. The session, "Exploring the effect of anthocyanin-rich foods on vascular function," will take place as part of the Vitafoods Education Programme on Tuesday 15 May 2018 at 16:50. Also in the spotlight on the Naturex booth at Vitafoods Europe 2018 will be Acerolife, a highly standardised source of natural vitamin C (up to 34%) derived from acerola cherries grown in Brazil. It is processed carefully to preserve the fruit’s naturally high vitamin C content. The resulting ingredient, Acerolife, is so rich in vitamin C that a lower dose is required to achieve 100% of recommended daily intake. It is ideal for dietary supplements and functional food & beverage products and is sourced via an acerola supply chain that is compliant with Naturex's Pathfinder sustainability programme.